Spray smarts More efficient sprayheads entering the market help save water and costs. Thirty-one billion gallons of water could be saved each year by replacing water-inefficient sprayheads with efficient ones, the U.S. Environmental Protection Agency estimates. 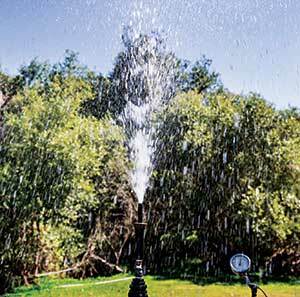 It’s no wonder the irrigation industry has started to see more water-saving sprayheads entering the market. After all, experts say water savings and cost savings go hand in hand. “Ultimately, the customer is going to have a lot lower water bill, which is a big incentive to implement water-saving products,” says Kelsey Jacquard, product manager, MP Rotators and sprays at Hunter Industries. To answer the growing demand, manufacturers enhanced their sprayheads to include high-efficiency features, such as pressure regulators, check valves, flow restriction devices and more. While drought-prone areas have experienced the biggest push for saving water, experts say water conservation efforts have touched many parts of the U.S. The company, headquartered in Richmond, Va., is a $7-million organization offering 100 percent irrigation services to a 65 percent residential, 35 percent commercial clientele. Water waste Without a flow-restricting device, a broken nozzle can waste up to 30 gpm of water. A countrywide trend toward smaller lot sizes also contributes to the push for high-efficiency sprayheads. For example, the median lot size of a new single-family detached home sold in 2016 stood at 8,562 square feet, compared to 9,148 square feet in 2010 and 9,388 square feet in 2000, according to the 2016 Census Bureau’s Survey of Construction. 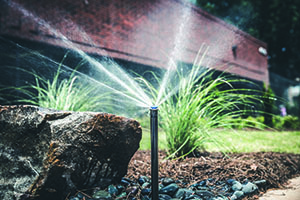 “With smaller lot sizes, we can now leave behind the high-water-throwing products like rotors and go to nozzles or sprayheads that throw water at a lower rate,” says Steve Counter, vice president of category management at SiteOne Landscape Supply. Catering to varying site requirements, manufacturers often offer a menu of sprayhead options, instead of an all-inclusive sprayhead, according to Chris Davey, product marketing manager for Toro. “For example, at Toro, you can buy the plain ‘vanilla’ sprayhead with nothing in the stem, the ‘Rocky Road’ version with everything in it or anything in between,” Davey says. While pressure regulators are not brand-new to the industry, they continue to make a difference in terms of water savings, experts say. “The benefits are pretty extreme,” Jacquard says, noting that water savings can be as high as 30 percent when water pressure is brought down to 30 psi. Pressure regulators can be beneficial in municipalities where the water pressure is high and in downhill situations. “If you’re building pressure in the pipes and you’ve got 60-70 psi coming in, the pressure regulation function works so the outlet pressure is a steady 30 psi,” Davey says, adding that Toro recently received EPA WaterSense certification on its 570Z sprayheads with pressure regulation. Implementing check valves is another route to water savings. Check valves prevent water from draining out of the sprinkler or sprayhead, especially in areas with slopes or elevation changes. Jacquard says Hunter approximates the water savings to be about 20 gallons if contractors install check valves in a zone that’s going to drain out. Manufacturers also have started to implement flow-restricting devices inside their sprayhead products to prevent water loss in the case of a broken or missing nozzle. For example, Hunter’s FloGuard feature reduces the flow of water from the riser down to 0.5 gallons per minute (gpm) and immediately generates a 10-foot tall indicator stream if a nozzle is compromised, according to Jacquard. Counter agrees, adding contractors may not even realize there’s a broken element unless they happen to walk by and see water puddling in the area. Toro also offers a flow-restricting feature, called X-Flow. It comes as an option on its 570Z sprayhead models. “The X-Flow shuts off the flow and allows a person to do maintenance on the sprayhead without getting a geyser coming up in their face,” Davey says. The pressure-activated, zero-flush wiper seal (ZFWS), also available on Toro’s 570Z sprayhead, is another byproduct of conservation efforts. A replaceable wiper seal in the cover of the pop-up sprayhead, the rubber ZFWS wipes or seals the stem as it pops up and goes down, reducing startup water waste, according to Davey. “It’s just a way to keep the stem clean so you don’t get grit and sandy bits and pieces of mulch in there,” he says. Jundt says Toro’s Precision Series Spray Nozzle can also help reduce water usage—by up to 35 percent, compared to many variable arc nozzles. “Variable arc nozzles throw massive amounts of water out that can never infiltrate into the soil, so you get runoff, and all the minerals leach off,” Jundt says. For the future, Jacquard says a lot of energy will be focused toward more water-efficient products, such as nozzles. “With high-efficiency nozzles especially, the precipitation rates are a lot lower, and they’re a lot less susceptible to misting and wind,” she says. Counter and Jundt share similar views about the future of sprayheads. “The biggest piece for the future is the continuation of how to make products more robust and efficient,” Counter says.